Every genealogist has at least one. I'm talking about the "Lost Lizzie" or "Elusive Edna" whose maiden name is left blank in your family tree. 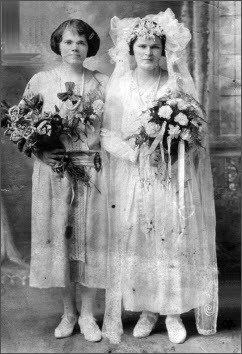 Indeed researching female ancestors can be one of the most challenging tasks in genealogy, but yet one of the most important to help trace family lines to the previous generations. Why are female ancestors often so difficult to trace? One of the main reasons is that prior to the twentieth century it was a man's world--well at least where society was concerned. Women didn't often own property, changed their names at marriage, and generally left behind fewer historical records than men. In addition, cultural influences played a role in how women were viewed and treated. If you're frustrated with all those "Anna (blank)'s" or "Mrs. so-and-so's" on your pedigree charts, here are five strategies for tracking down those mysterious maiden names. When I began researching my roots more than 20 years ago, I actually started with my maternal grandmother. Looking back, this probably wasn't the best strategy. But I got lucky. 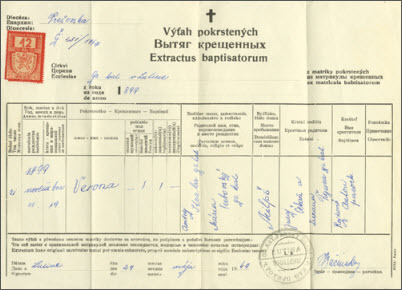 My mother was a packrat who saved everything, including my grandmother's baptismal certificate and passport, which fortunately contained my grandmother's maiden name. But what happens when you don't have this information? Well, then you need to start asking questions. Contact all of your relatives, friends of your relatives, even distant cousins. Don't rule anyone out. Sometimes close family members won't remember everything or may even employ a bit of "selective amnesia," so you need to keep asking until you find someone who can give you answers, or even the smallest clue on where to look next. Search free online telephone directories for those surnames you do know. While some directories such as Yahoo! People Search or ZabaSearch, are restricted to the U.S., others including Infobel or NumberWay, may help you track find information individuals residing in foreign countries. You should also scour message boards such as those at GenForum or RootsWeb, or check sites such as Lost Cousins or World Connect. Don't forget to utilize social networking sites such as Facebook or Twitter to broadcast the surnames you're researching, and/or search for potential long lost cousins. If you successfully make contact, don't forget to ask them about any family documents, photos, Bibles, yearbooks, or other keepsakes, as any of these items could possibly contain a woman's name, key dates, or other useful information. While it's true that most of the historical records were created by and about men, there usually are some documents that mention the women in their lives (mothers, daughters, wives, etc.). A good place to begin is with a woman's marriage record. To get a copy of the marriage application, check the local or county courthouse. You might be able to find some indexes online. Consult Joe Beine's Online Birth & Marriage Records Indexes for the USA, a genealogy guide for finding vital records. Each state began mandating the keeping of vital records at different times, and has its own laws regarding access and cost, so you may hit a roadblock when searching for your ancestor. If so, then try church records, which may contain even more details because the priest or minister would generally know the couple or family. If your ancestor practiced in the Christian faith try USA Church.com to locate a parish in her hometown. Consider the possibility of more than one marriage and multiple burial markers. If a woman died shortly after marriage, she will frequently be buried with her family. A woman may often have an infant buried alongside. Be aware of multiple marriages and instances of two gravestones--one erected where she resided at the time of her death, and a second where she lived the majority of her adult life. Free sites such as Find-a-Grave and Interment are good places to start your search for grave records. Be sure to check all records for her husband, especially tax, property, employment, wills, probate dockets, and military pension records. If your ancestor was naturalized, try to track down her declaration of intent (called "first papers"). Before 1906 these documents are usually found at the county courthouse. Until 1922, wives were sometimes listed on their husbands' naturalization records (children under 16 were listed on their father's forms). After that time you'll find separate records for married women. Before 1906, immigrants filed for naturalization in their municipal, county, state, or federal court. For naturalizations dating from September 27, 1906 to April 1, 1956, you can order copies of of records using the United States Citizenship and Immigration Services (USCIS) Genealogy Program fee-based request system. However, before paying for records, first check the Church of Jesus Christ of Latter-day Saints Family History Library's RecordSearch site, which has a number of free indexes and digitized images available. If you don't find who you're looking for there, try searching the Family History Library catalog to order microfilmed records to view (for a small fee) at your local Family History Center (FHC). Another excellent source of information is newspapers, including obituaries (look at who the deceased is "survived by"). Try searching some free web sites for recent obituaries such as Legacy.com or Tributes.com. Also, check for engagement announcements, anniversary notices, social columns, county fair, criminal reports, and other newsworthy events. An excellent source for older obituaries, and other news items is the Google News Archives site. Also, you can search hundreds of newspapers from 1880 through 1992 for free in a database at the Library of Congress. Your local public or university library may also have ProQuest historical newspaper databases available. Your ancestor's name can help or hinder your search. A common name such as "Mary" or "Anna" makes culling online indexes and databases tough. Check the Given Names Frequency Project to check the popularity of your elusive female's moniker. You may have better luck if your ancestor had an unusual first name such as "Xenia" or "Verona." Also, don't forget to search for nicknames (e.g. Peg, Peggy, Meg, Margie, etc, for Margaret). Learn naming practices and patterns and note regional, cultural, and religious influences. Check for variations on names. For example: Elizabeth (English) vs. Alzbeta (Czech & Slovak) vs. Erz�bet (Hungarian). Note instances where suffixes are added to feminize a name. For example, the Slovak practice of adding -ova indicates a married name (e.g. Lesko would become Leskova), or for Scandinavians, the suffixes -dotter, d�ttir, or - datter for "daughter of". Sometimes daughters were named for mothers or grandmothers, or a mother's maiden name might appear as a Christian or middle name for a child (e.g. Evelyn Vallis Neville). When searching online databases, indexes, or paper records, be aware of spelling variations for both names and places, taking into account how transpositions of letters, phonetics, and poor handwriting may alter a name. Be sure to check records for a woman using both her married and maiden name. Always verify information and spellings from online and print sources. Even official documents contain errors. Don't expect the names to appear on American records the same way they will appear in documents from the old country. And don't buy into the myth that immigrants' names were changed at Ellis Island. Immigrants carried documentation, and information on passenger lists was written or typed at the port of embarkation, not at arrival. Most name changes occurred afterwards, as immigrants desired to fit in--to sound more American, or make their names either to spell or pronounce at work or school. Free tools such as Steve Morse's One-Step Web Pages can help you perform "sounds-like" searches in US passenger lists for those exotic-sounding surnames. Can't find a birth, marriage, or death record in the town or county where your ancestor settled? Perhaps you need to broaden your search to surrounding counties, or even other states. Ancestors were often on the move for personal, family, employment-related, or other reasons. If you've hit a brick wall, try tracking your female ancestors movements by create a timeline to place the woman's life in historical context and to help identify cause-and-effect situations. Begin the timeline with the woman's birth and end it with her death. Write down everything that you do know about the woman, her husband, children, and the names of any siblings. Include significant dates from world, U.S. and local history (e.g. the Civil War, World War I, the Great Depression, etc.) to get a sense of what was happening during each stage of the woman's life. You can set your timeline up as a simple word processing or spreadsheet document, or use a free web-based timeline such as OurTimelines, or Preceden. Many popular commercial family tree software products also have built-in features for generating timelines. Hitting an impasse with your immediate ancestor? Then check records for a woman's siblings, cousins, friends, and neighbors. She may show up as a household member, godparent, heir, or in-law. In particular, witnesses to a woman's or her family members' baptismal records, marriage licenses and naturalization papers may be related to her. Check census records for all of the family's nearby names. Try to spot a female with the appropriate first name, age, and birthplace. You may find her in later years living with a sibling, parent, child, or even listed under her maiden name if a widow or divorcee. Once you've uncovered the details of your female ancestors' lives, it's important to document them for future generations. This can be accomplished in any number of formats: a scrapbook, a series of character sketches or profiles, a blog, or even a book! If the empty branches of your family tree include mostly women, don't despair. With a bit of patience, persistence and creative sleuthing you can track down the missing pieces, erase those blanks in your pedigree chart, and break through the silence to tell your female ancestors' stories.